Gold chain looks great and of course high reliability as expected from KMC. Very easy to fit with the masterlink. These chains are awesome. The missing link is fantastic. Taking the chain off to clean is a bonus as chain scrubbers are only so good, especially if you live in a sandy or dusty area. Buying a missing link chain tool will help also. After buying many, MANY chains over decades, and after buying my fifth one of these now, it's the only one I will continue to buy. WAY better than Shimano and SRAM in all my real-life testing. Big fan of KMC Chains. I believe they make most of the branded chains. So makes sense to buy them. 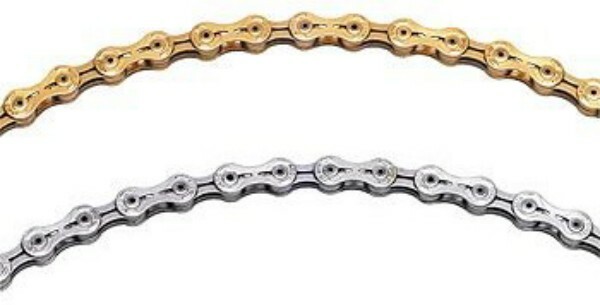 Have been using KMC chains for a while now on a variety of road and mountain bikes so the performance of this chain hasn't come as a surprise; The chain works perfectly, equally as well as any alternative, it also looks great in the gold finish (although my local off road riding is quite sandy which seems to take off the finish a bit quicker than I'd like) and the punched out sections keep the weight down. The KMC chain connector is great making chain removal much more simple than messing around with a chain tool. I've bought a good few of these before and will do again, great chain. Nice and light and runs very quietly. Good price too. This chain looks awesome and is super smooth. I will be purchasing it again once this one wears out! Great chain, easy to fit and remove, shifts well and is light. Super light, smooth like butter. Best chain on the market. Low weight, easy to install, with a good life span. As always an excellent product from KMC, light very strong, very durable, shifts really well with either shimano or sram equipment, I would not use any other manufacturer of chain now. Been using these for four years now and never had a problem. The best chain I ever had! Durable and can put many miles on it. Superb chain, lightweight and keeps it's colour, on my second one because I liked the first one so much! Having used this chain before I knew of its quality and durability and let's not forget the bling factor. MERLIN are selling this at a great price and as always great service from them, this is a highly recommended addition to your drivetrain . Excellent chain, well made, light & strong. Includes a missing link which makes it great value as these on their own are silly money. I have one of these on both my bikes. THE BEST CHAIN (at this price). Light, strong and precise, a pleasure to change gear. Wears well too, look after it! Superb. Smooth and quiet, trouble-free shifting. Highly recommended. And of course, as usual, excellent service from Merlin Cycles. Quick to install. Good performance chain. Now on my second and the best chain money can buy. My old one had plenty of life left but I replaced it before it got too worn. First class chain, quick link is the way, no special tools needed. I cant understand why other brands don't use this method. Reliable and hard-wearing, with the convenience of the missing-link. And light to boot. Slightly noisier on the cross-gears than the Shimano DA chain, but I can live with that for twice the life. The best chain I have tried. Perfect shifts, long lasting and lightest around. Top chain, looks superb and functions flawlessly. KMC are the best for me..
Great price again from Merlin, quick delivery, this chain is very light and silent running lubed with purple extreme I am very impressed. Great chains, seamless changing better than some OE products. This chain is super light, strong and easy to put on. Does the job perfect, 5 stars to Merlin! Received in perfect condition and well packaged. Merlin was quick to ship it. Missing link is included as stated. EASY TO INSTALL AND IS WORKING WELL ON THE FIRST COUPLE OF RIDES. .
Have used other brands of chain in the past but since using KMC I use nothing else. Easy to fit and remove. Great longevity and super shifting. Highly recommended. If you are looking for a new 10sp chain just buy this one. Its light, cheap and mega easy to fit! Have these on all my bikes now and wouldn't consider anything else. Good quality chain, very easy to fit. Looks good too. Excellent chain - had the 9 speed version previously, since then all my chains will be KMC!